Marathon musings. And a few tears. So, here I sit in Mumbai airport, waiting for my delayed flight back to Delhi and the cold and smog. 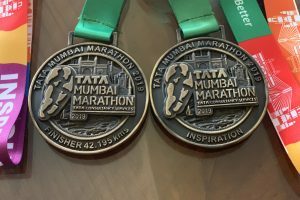 Yesterday I ran the Tata Mumbai Marathon, my 4th time here, and my 7th overall marathon. “So how did yesterday go?” did I hear you ask? Actually, you know what, it went very well, in fact. 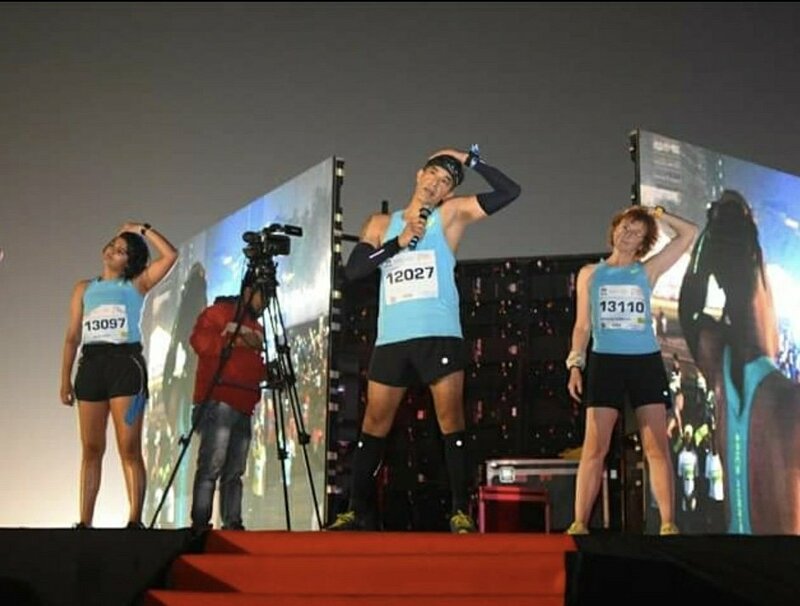 I managed to run my fastest time ever for Mumbai, which felt wonderful, but it was not my fastest marathon time overall. A whole 6 minutes faster than last year, but I didn’t crack 5 hours, which I’d hoped for, missing it by a measly 48 seconds. Now I’m kicking myself for slowing down to that walk that most definitely cost me a benchmark time. But I didn’t injure myself, or feel sick, or any of the other things that bug we marathoners, especially on such a hot and humid day like yesterday. I saw in the papers this morning that there was a marked increase in runners needing medical treatment. According to the Times of India, over 3,200 runners needed medical treatment, so lucky old me. For those of you who have run a marathon, and especially any of you who ran yesterday, you’ll know what I mean when I say that despite whatever the weather gods throw at you on race day, despite the exhaustion, crossing that finish line, after 42.195km, is one majorly fantastic experience. Yesterday was hot and humid. Pedder Road doesn’t get any easier (but I’ve learned how to deal with it). But the spirit of Mumbai was on such wonderful display, with fabulous crowd support all along the route, and that is something that eggs you on. The smiling, the cheering, the signs held aloft, people offering you food and water and salt or a spray for aching muscles…it is quite a spectacle. All along the route there are people cheering, smiling, just being there. At one point, running through Mahim, which was about 25/26km into the race, I think (so on the homeward straight) I found myself close to tears. 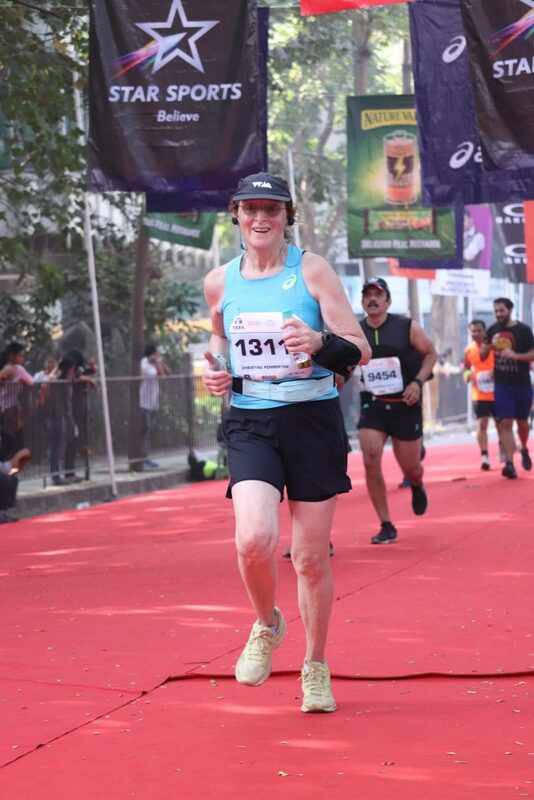 A combo of the music playing on my playlist, and the smiling faces along the way, and the realisation that here I am, 65 years old, and able to run a marathon. And I got all choked up and tears came to my eyes – as they are now, actually, as I relive the moment. It was such an intense feeling of being alive and healthy and privileged enough to be able to run. OK, I’ll stop right there, before this becomes embarrassingly emotional. There was also a very different, very happy twist to this marathon, my first since being appointed an influencer by ASICS. It was such a wildly unexpected compliment from ASICS, in this brave new digital world of young people, to be made an influencer, that I’m still slightly in thrilled denial. To every single Mumbaiker who was out there supporting the runners – thank you! To every lovely runner who talked to me, or told me to speed up when I flagged, or who said they read my blog, or follow me on Insta – thank you! I hated the chafing from my arm-phone-holder-thingy. But that was small beer in the overall scheme of things. I loved being back in the Maximum City, and I’m leaving (if my flight ever takes off ) with love and gratitude for such a fab place. You are such an inspiration Christine. At the cost of repeating myself over and over, you never fail to amaze me. Keep rocking dear and we shall cheer you on each year. Much love and hugs.